We would like to again recognize our sponsor, Senator Bill Heath, for his tenacity in working to get this done this session and we'd also like to again thank our friends at NRA-ILA for their assistance. Efforts to completely eliminate the carry length limit have been stymied due to the manner in which a knife is defined in Georgia law. This will make life much better for knife owners in Georgia without hampering future efforts to completely eliminate the carry length limit at some future opportunity. March 28, 2017: By a vote of 37 to 16, the Georgia Senate has passed HB 292 that includes the language from Knife Rights' Georgia Knife Law Reform bill, SB 49. This would increase the legal carry length of a knife blade in the state from 5 inches to 12 inches (see Section 3 of HB 292). HB 292 is this year's "omnibus" gun bill in Georgia which had previously passed in the House. It was amended in the Senate, including the addition of our language, and now goes back to the House for a concurrence vote. That is not expected to be a problem. 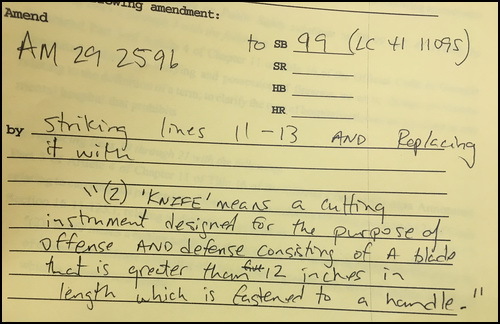 March 16, 2017: The language from Knife Rights' Georgia Knife Law Reform bill, SB 49, that would increase the legal carry length of a knife blade in the state from 5 inches to 12 inches, has been added as an amendment to HB 292 and voted out of the Senate Judiciary Subcommittee. The full committee vote is expected shortly. HB 292 is this year's "omnibus" gun bill in Georgia which is strongly supported by the NRA and had previously passed in the House. HB292 must still pass the Senate and then go back to the House for approval of the changes, but things look positive for it to move at this time. As you may recall, two weeks ago the same language was amended onto another bill in the Senate, SB 99, which passed and was sent to the House. At this point we have two opportunities to get this language enacted into law. This is great news for knife owners, makers and manufacturers in Georgia and those who attend the BLADE Show in Atlanta every year and this year's NRA Annual Meeting which is also being held in Atlanta. We would like to thank Senator Bill Heath for his tenacity in working to get this done this session and we'd also like to thank our friends at the NRA-ILA for their assistance. 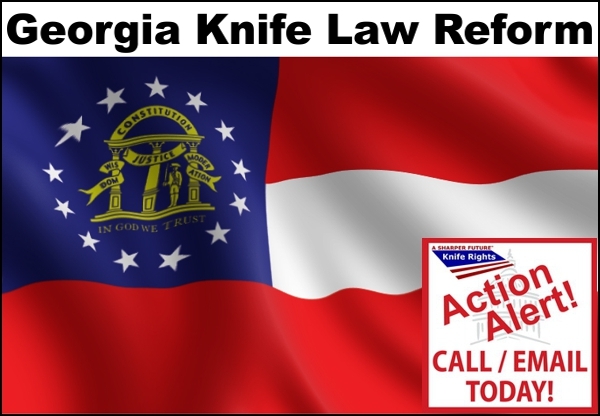 March 3, 20177: Knife Rights' Georgia Knife Law Reform bill, SB 49, that would have increased the legal carry length of a knife blade in the state from 5 inches to 12 inches was saved at the last minute when the language was amended onto another bill, SB 99. That bill has been passed by the Senate and will now move to the House with our knife law reform language included. We'd like to thank our sponsor Senator Bill Heath for his valiant efforts that succeeded in keeping this bill alive. February 28, 2017: Knife Rights' Georgia Knife Law Reform bill, SB 49, that would increase the legal carry length of a knife blade in the state from 5 inches to 12 inches needs to be voted on by the full Senate by Friday or it will die. We need to get the RULES Committee to release the bill for a vote. If you live, work or travel in Georgia, or plan to (like to BLADE Show in Atlanta), please CALL or EMAIL the RULES Committee Members TODAY and simply deliver the message that you are calling or emailing to respectfully request that they please pass SB 49 out of the Rules Committee, so that it may be voted on by the full Senate, and then thank them. Please be POLITE and RESPECTFUL and REMAIN ON POINT. February 2, 2017: Knife Rights' Georgia Knife Law Reform bill, SB 49, that would increase the legal carry length of a knife blade in the state from 5 inches to 12 inches, was passed out of the Senate Public Safety Committee with a "do pass" recommendation. Your emails and calls to legislators are having a positive effect. The bill now moves to the full Senate for a vote. If you live, work or travel in Georgia, or plan to (like to BLADE Show in Atlanta), please CALL or EMAIL your Senator TODAY and simply deliver the message that you are calling or emailing to respectfully request that they please VOTE YES on SB 49, an important criminal justice reform bill, and then thank them. Please be POLITE and RESPECTFUL and REMAIN ON POINT. Click here to locate your Senator. February 2, 2017: Knife Rights' Georgia Knife Law Reform bill, SB 49, that would increase the legal carry length of a knife blade in the state from 5 inches to 12 inches, has been sent to the Senate Public Safety Committee. If you live, work or travel in Georgia, or plan to (like to BLADE Show in Atlanta), please CALL or EMAIL the committee members TODAY and simply deliver the message that you are calling or emailing to respectfully request that they please VOTE YES on SB 49, an important criminal justice reform bill, and then thank them. Please be POLITE and RESPECTFUL and REMAIN ON POINT. January 25, 2017: Georgia State Senator Bill Heath has introduced Knife Rights' Georgia Knife Law Reform bill, SB 49, that would increase the legal carry length of a knife blade in the state from 5.5 inches to 12 inches. Sen. Heath was the sponsor of Knife Rights' Georgia Knife Law Preemption bill that was enacted in 2012. SB 49 is co-sponsored by Senators William Ligon, Jr., Tyler Harper, Marty Harbin, Bruce Thompson and Frank Ginn. The bill has not yet been assigned to a committee. Once assigned we'll let you know who to contact to help move the bill forward.